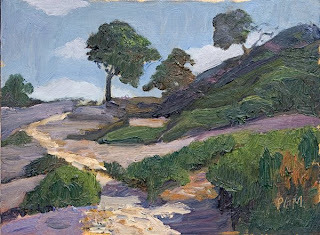 Landscape Oil on gessoed card 6"x8"
In this painting I have simplified the elements into colour masses and restricted the range of tonal values. I have used a small painting by Glenn Dean as the starting point. He in his turn has been influenced by Edgar Payne the American landscape painter. I enjoyed using thick juicy impasto for this painting.